UPDATED: Wed., Feb. 6, 2019, 9:16 p.m.
Police at Central Washington University searched the school early Wednesday evening after a report of a school shooter led to a campus lockdown, but found nothing. 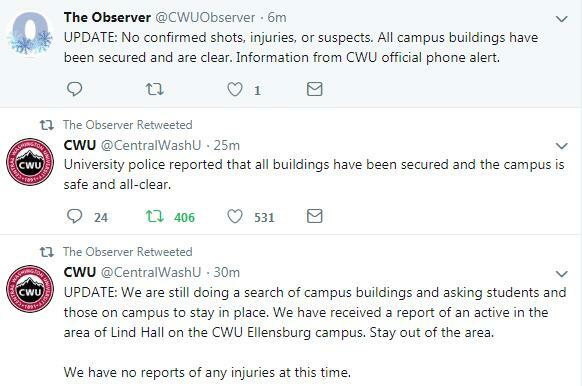 Police had no suspects and had not made any arrests, according to a tweet from CWU, and there are no confirmed reports of shots fired. An active shooter was reported at the Ellensburg campus at about 5:30 p.m. Wednesday and the lockdown followed. University police reported the school was safe and all clear at about 7:15 p.m.
Police received the initial 911 call from a student in Ferrell Hall who said she received a text from a friend in Lind Hall, saying it was being evacuated because of a shooter, according to an audio recording of the call. Both CWU Police and the campus student newspaper, the Observer, reported the incident at about 5:30 p.m.
Mariah Valles, Observer editor-in-chief, said at about 5:20 p.m., her class in Lind Hall was evacuated to a secure area off campus and 10 minutes later she received the alert about the shooter. Valles heard no gunshots, she said. She could not confirm the reports of the shooter: “I’ve heard so many different things at this point,” she said. Published: Feb. 6, 2019, 6:17 p.m. Updated: Feb. 6, 2019, 9:16 p.m.